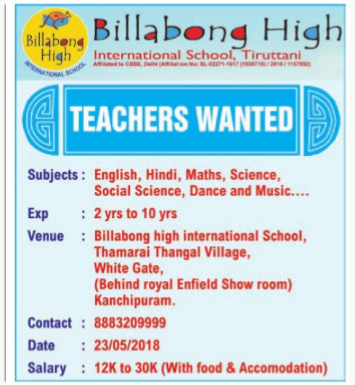 Billabong High International School, Tiruttani has advertised in THE DINAMALAR newspaper for recruitment of Teaching,non teaching staffs jobs vacancies. Interested and eligible job aspirants are requested to attend interview 23/05/2018. Check out further more details below. Name of the School: Billabong High International School, Tiruttani. About School: Kangaroo Kids Pre-Schools and Primary Schools were created to fire the imagination of children from a young age. The goal was to create fun and make learning a rewarding experience, which impression children would carry forward to the rest of their learning lives.After developing unique and successful learning systems for preschool children with Kangaroo Kids, Kangaroo Kids Education Ltd (KKEL) devised learning systems for Primary School [Grade 1-4], Middle School [Grade 5-8] and High School [Grade 9-12] under the brand name of Billabong High International School.